It’s been awhile since we featured a cool geeky cake and this one qualifies. Makes me hungry just looking at it. 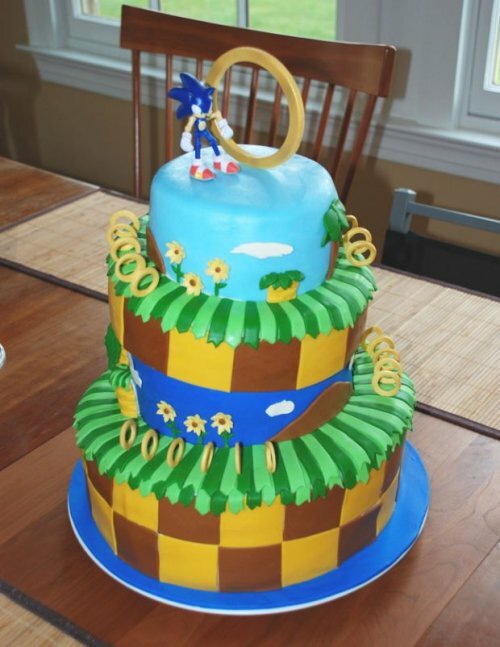 If I could, I would run circles around this cake like Sonic himself as I gobbled up those rings, that icing and all the rest of it. And I wouldn’t share. This would strictly be a one player game. It would be delicious. Sega-licious. Looks like Sega is the latest online entity that has been hacked. Sega Pass, the company’s web portal, suffered a breach on Thursday, which affected 1.29 million users. The hackers got everything. Usernames, the customer’s real names, birth dates, passwords, email addresses, etc. They did not get credit / debit card numbers however. Sega’s keeping the Pass service offline for now while it beefs up security. We wonder who will be next and when this craziness will stop. If you love Dreamcast and own either a PS3 or an Xbox 360, we have some good news. SEGA is releasing its Dreamcast compilation to both platforms very soon. The price is an affordable $29.99 for the compilation. So you can play all of these classic games without dragging the old console out of the closet. The titles and a date have yet to be released, so we hope it has a good selection for the price. Even if they only include some of the hits, it will be well worth it. SEGA, not content with Sonic and other fun games, has a new console that will revolutionize the industry. Or at least the men’s room. Known as ‘Toirettsu’, these urinals will have a sensor target which is capable of detecting when it’s being peed on, and it will know the strength of the stream. This data will tie into mini games that are displayed on an eye-level LCD display. You can do stuff like fight fires or shoot milk out of your character’s nose. All brought to you by the power of pee and Sega. Fighting boss battles together in a restroom hopefully not near you. Back in the day, I played a lot of games on the Nintendo, Super Nintendo, and the Sega Genesis. I think a bunch of people out there probably have the games and controllers lying around, but the consoles are broken. 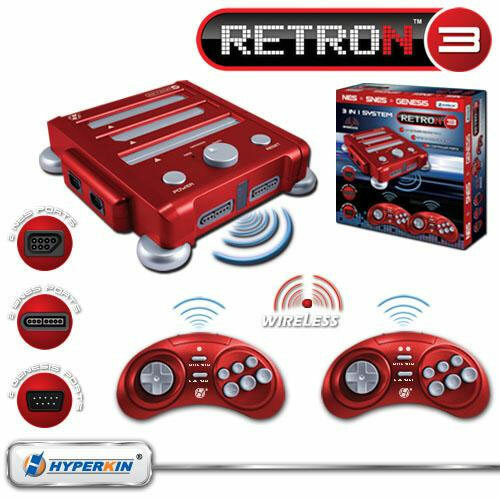 Hyperkin has unveiled a dirt cheap game console that will play cartridges from the SNEs, Genesis, and the Nintendo game system. You can finally get some use out of those old gigantic Nintendo cartridges other than taking them apart to mod. Turn that trash down! But dad I’m just playing video games. On my boombox. Modder XCKDIY has created the awesomely retro Dreamcast Boombox casemod. 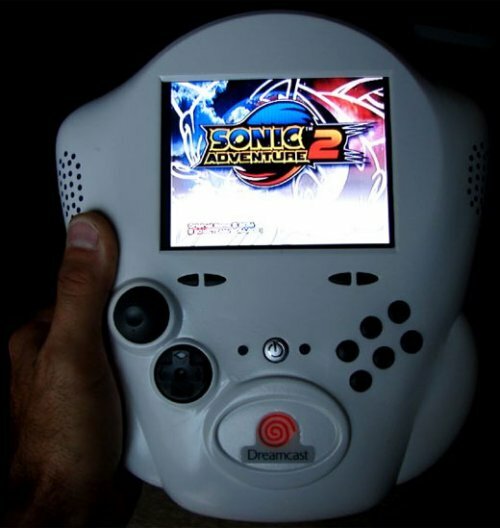 The Dreamcast console has been jammed into a portable boombox, and he installed a front-facing LCD as well. The Dreamcast’s drive has even been integrated into the player’s original drive tray, keeping it all authentic. The four controller ports are in the front, so you can easily hook up your controllers for some multiplayer gaming. She may not look like much, but she’s got it where it counts. Very true. 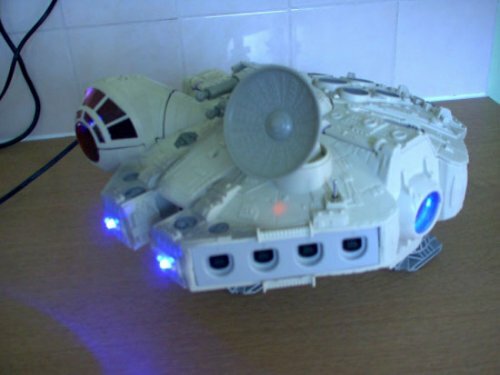 Especially when you cram a Sega Dreamcast into a Millennium Falcon toy. User “Pezzapoo” of the Ben Heck forums sure made this one look good. The DC game port facia fit into the toy with only about a millimeter to spare. That’s when he knew it was magic. In case you were wondering, two side docking ring fans keep the hot DC from melting. Anytime some modder puts a console in a Star Wars ship, somewhere far far away, an X-Wing gets it’s wings. 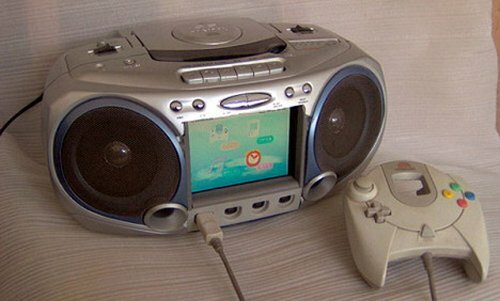 Naturally whenever you look at your old video game consoles, you think iPhone dock. Who doesn’t? Wired’s Charlie Sorrel certainly thinks that way. 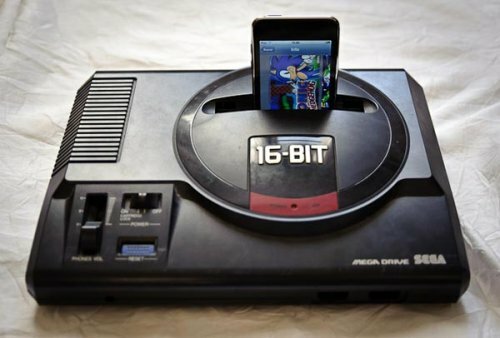 He found an old Sega Mega Drive without any controllers or wires, so he turned it into an iPod dock. Naturally. And yes it works. He just slid an iPod dock inside, secured it with gaffer tape and ran the USB cable out of a hole. Easy stuff. We like the way Charlie thinks. Just don’t let him near your stuff. Seriously. Not unless you want an iPhone sticking out of it. Now and then we find ourselves covering lighters. Maybe because they have an unusual shape, feature video game characters or in this case because they are in the form of a Sega Mega Drive and a Sega Saturn. Through November 6, retailer Net-You is taking pre-orders on these beautiful Sega Hard Memorial Zippo Lighters made by Banpresto for about $115 each through November 6th. They ship in December. It’s time to get that Polyester out of the closet that you’ve been hanging onto for the past 30 years. Might as well put on the platform shoes too. While you’re at it, renew your crush on Olivia Newton John. Your time has come again Disco Stu. This Sega Hitokara karaoke machine has two interesting features. it’s connected to a cloud-based database of 43,000 songs via cellphone and it’s got a spinning, light-up mirrored disco ball. ZOMG. It’s for those who love the night life and love to boogie. It will make you the new Dirk Diggler of Karaoke. 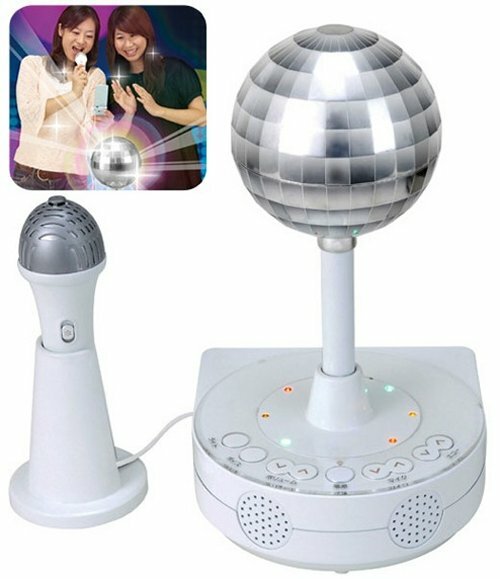 Assuming of course that you really really love karaoke and disco lighting. This must be how Stormtroopers get their game on, since it matches their armor pretty nicely. It really is a nice piece of work. Created by Hailrazer on the Ben Heck Forums in about 90 hours. He used a kids toy called “Lazer Doodle” for the case. It reminds us of what used to be. 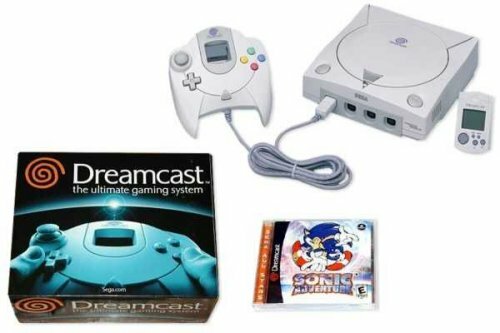 And it reminds us of the Dreamcast’s short life-span and the untimely demise of what some consider to be one of the greatest video game systems of all time. It features a Sony PSOne 5″ LCD screen, an InterAct Quantum Fighterpad controller, stereo speakers and a battery pack which lets him play for about 2.5 hours per charge. Nice! Back in the day Sega’s Megadrive boasted superior graphics to the NES, not that Mario and Luigi seemed hurt by it. 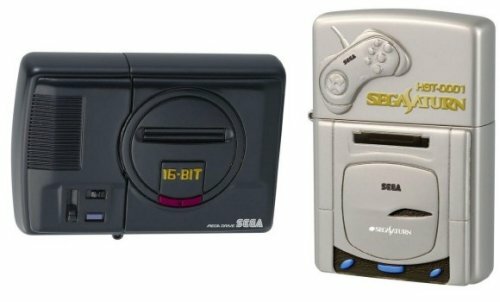 Now Blaze will be unleashing a 16-bit Megadrive handheld this month, so you can relive your youth and play Sega Megadrive classics like Sonic and Knuckles, Golden Axe, Shinobi and Ecco the Dolphin. Other games include Alex Kidd – Enchanted Castle, Alien Storm Altered Beast, Arrow Flash, Crackdown, Decap Attack, Dr Robotnik’s Mean Bean Machine, Ecco Junior, Flicky, Gain Ground, Jewel Master, Kid Chameleon, Sonic Spinball and Shadow Dancer. It’s powered by 3 AAA batteries and will retail for £29.99. This bot makes Sony’s Rolly look like the lame dancing egg that it is. AMP stands for Automated Music Personality, from Hasbro’s Tiger Electronics and Sega Toys, and it’s here to dance, follow you around with music and look just plain awesome. 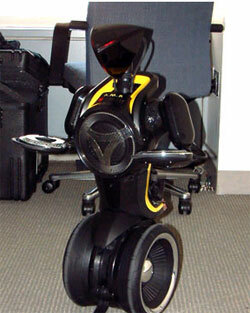 It’s got Segway-like legs that dance to the beat of any MP3 player via a 3.5mm jack. Also sports 49 LEDs that shine nicely too, because bots have to have lights. The A.M.P. has touch-sensitive DJ scratching pads and 62 sound effects built in so you can jazz up your songs, and an IR sensor so he will follow you from room to room and keep the music with you at all times. 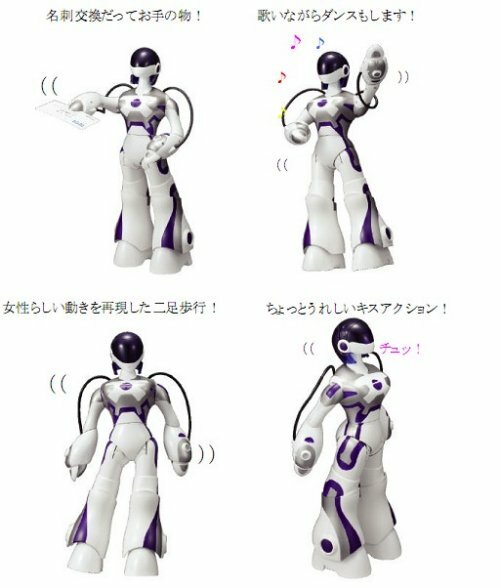 The robot is of the female persuasion and stands at 38 cm tall. According to Sega, the E.M.A. is special because of her “glamorous body” and because she’s highly interactive. (Translation:Only a nerd could love that body and she kinda puts out.) She’ll sing and dance, hand out your business cards, even walk “like a lady”. I wasn’t kidding when I said she puts out. She won’t go all the way, though I’m sure some of you will force the issue, but she will kiss you if your head comes into close contact with her. That’s when the love mode switches on.